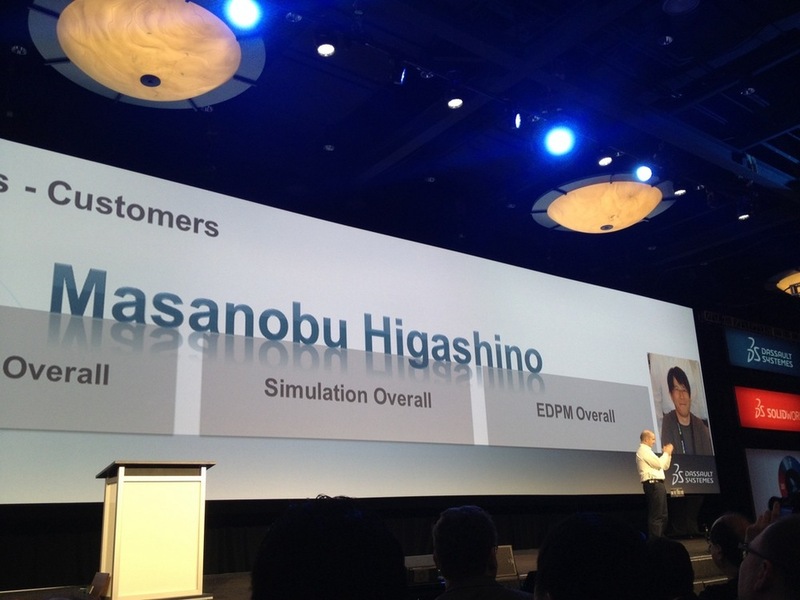 Then Fielder Hiss took the stage to announce the winners of the SolidWorks 2013 Beta contests, including the first Triple-Crown winner! 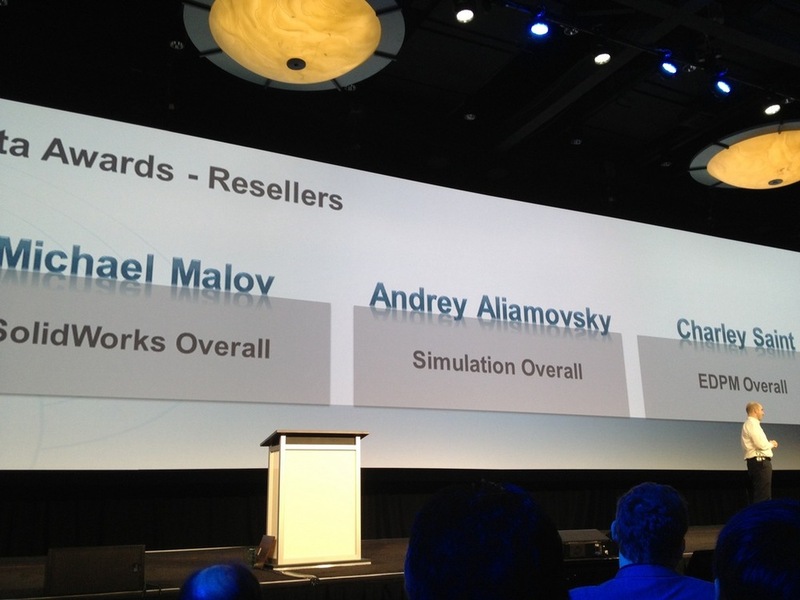 Richard Doyle took the stage next to tell us about the amazing SolidWorks community and User Group Network. Richard then took a moment to remember beloved user group leader and SolidWorks Community icon, Wayne Tiffany. Wayne’s sons honored us by leading a moving tribute to their father, as we helped them learn a little more about what he meant to the community. The Tiffany brothers received a standing ovation from the User Group Leaders, who were doing their best to hold their emotions in check. From now on, the User group leader of the year award will be presented in Wayne’s memory, and this year’s recipient of the award was Peter Fischer. The User Group of the year award was also presented to the New York City SWUG. 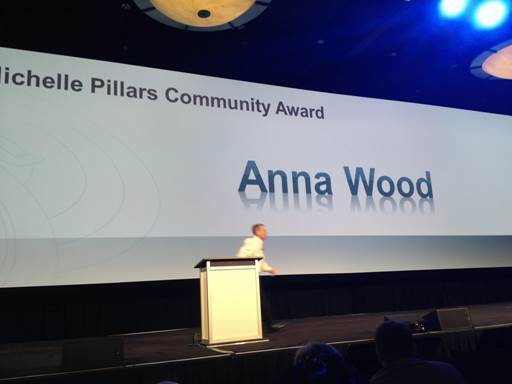 The final award – also named for a departed SolidWorks exemplar – is the Michelle Pillars Community Award. This year, Anna Wood of RenderBay, llc was awarded the honor. 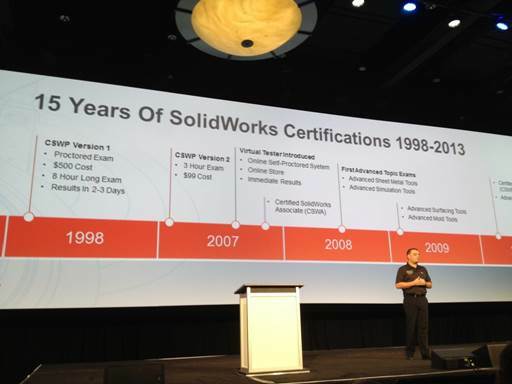 Next up, Avelino Rochino and Mike Puckett of the SolidWorks Certification team gave us some information about the past 15 years of the certification program. 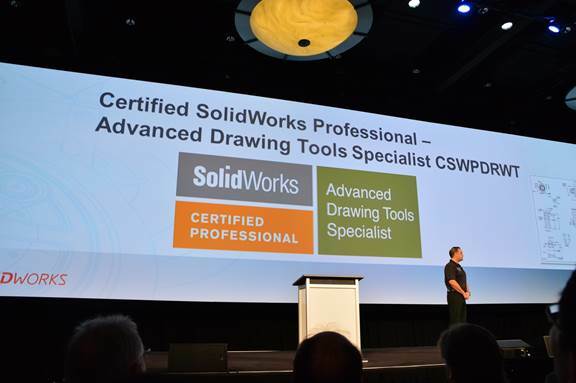 Did you know that 3.5 million SolidWorks Certification questions have been answered so far? Or that Mechanical Engineers hoping to work at Disneyland can’t even get an interview without their CSWP? The Certification guys then announced a band-new exam. The Advanced Drawing Tools Specialist (CSWPDRWT) tests users on their 2D drawing prowess. Next, we were introduced to Professor Vijay Kumar, of the University of Pennsylvania. 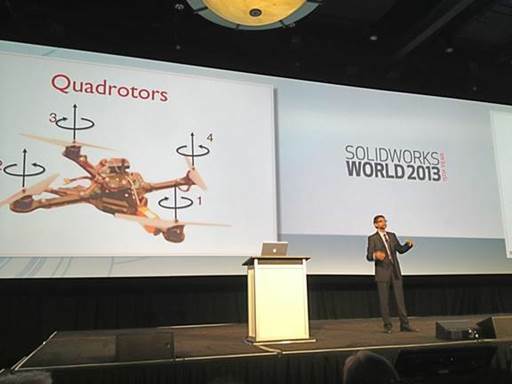 Dr. Kumar and his students have designed an incredible swarm of autonomous flying robots. The robots can, individually or as a swarm, map a dangerous building using Kinect technology, assemble large structures, find their way through tight spaces, and even play the James Bond theme song. These robots are so awesome, they even caught the attention of The Rev. Sir Doctor Sen. Stephen T. Mos Def Colbert, D.F.A., Heavyweight Champion of the World. Rick Chin introduced the next incredible speaker, who comes from the German company, Festo. Elias Knubben is the Head of Corporate Bionic Projects, and also lifetime member of the Best Job Title Club. Elias showed us several projects that blend nature and technology in a way that can help mankind. We saw the manipulator arm which has incredible strength, adaptability, and dexterity, just like an elephant’s trunk. We also saw the magnificent flying robotic bird, which perfectly mimics the wing movement of an actual animal. The flapping motion is so efficient, the robot doesn’t need any lighter-than-air gasses to stay aloft, as we saw in a surprising live demonstration. Stay tuned for tomorrow when we’ll hear about all the new and exciting features coming in the next version of SolidWorks, and much more!